We are proud to be serving you since 2017 and we would like to thank you for being a valued client of us. We are exited to offer you a 40% discount forever with any shared hosting packages for Our 1st Anniversary & Sinhala Hindu New Year celebration. We started our services in 2017 as a small web hosting service provider. 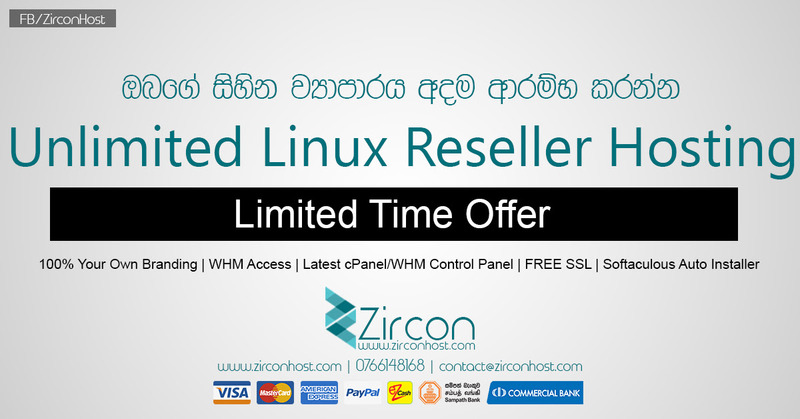 When we started our hosting services, the hosting package range of the providers based in Sri Lanka was over-priced. Our main objective was to provide outstanding services for the best possible price. We are proud to be the first and only budget and reliable hosting provider in Sri Lanka and we are also proud to say that our price range is still unbeatable. When we started reducing the prices, a lot of old fashioned web hosting businesses also started reducing their prices and also started saying that we would not be able to run for a long time, and the other complain was that it’s impossible to provide packages with “unlimited hosting/bandwidth” and it does not exist. For last years, we proved it was possible and currently we are serving more than 999+ customers and providing shared hosting for more than 1500+ websites. One years of journey was not that easy, we did not want to stay at the same place like the other hosting providers. We wanted to continuously and constantly innovate and upgrade our services at no additional cost to our customers. We have introduced different types of services, sometimes they had not been successful and we had to discontinue them. 24/7 Technical Ticket and Email Support with improved average response time of 30 minutes. Introducing phone technical support service for an additional fee OR pay as you go. Highly durable and redundant cloud shared hosting services. Enhanced malware protection and spam prevention measures. Partnered with major domain registrar’s to offer the lowest possible price. Directory listing and SSL program.